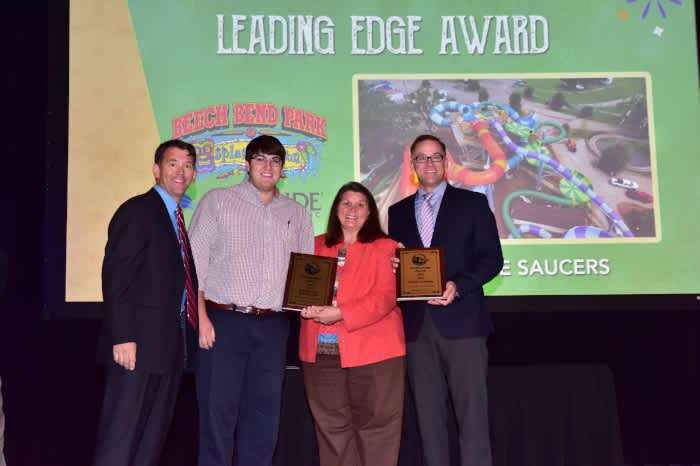 Bowling Green, Ky. – October 21, 2016 –The World Waterpark Association awarded Beech Bend Park & Splash Lagoon the Leading Edge Award at its annual conference last week in New Orleans. The conference is the world’s largest waterpark educational program and trade show. The Leading Edge Award is given to individuals or parks for creativity in the development of new themes, facilities, programs, services or operational concepts in the water attractions industry. Beech Bend Park & Splash Lagoon and ProSlide Technology received the award for the new Cyclone Saucers addition of its major 2016 waterpark expansion. ProSlide technology’s award-winning plan included the Cyclone Saucers, the first slide of its kind in North or South America and the only gravity-fed ProSlide ride in the world. The unique shape creates a new type of water ride experience with maximum curving speed and centrifugal force. Rafts can climb higher and hang in zero gravity longer than any other ride on the market. Be sure to visit Beech Bend Park & Splash Lagoon when the amusement park opens its spring season. 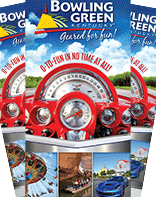 Keep up with the park’s special events and schedule by calling 270-781-7634 or visiting www.beechbend.com.